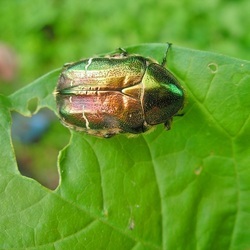 (Linnaeus, 1758) Cetonia aurata, known as the rose chafer, or more rarely as the green rose chafer, is a beetle, 20 mm (¾ in) long, that has metallic green coloration (but can be bronze, copper, violet, blue/black or grey) with a distinct V shaped scutellum, the small triangular area between the wing cases just below the thorax, and having several other irregular small white lines and marks. The underside is a coppery colour. Overview The flight pattern of a rose chafer Side view Close-up Rose chafers are capable of very fast flight; they do it with their wing cases down thus resembling a bumble bee. They feed on flowers, nectar and pollen, in particular roses (from where they get their name); which is where they can be found on warm sunny days, between May and June/July, occasionally to September. The cetonia aurata pulls the feets inside of the legs and push them out if it is needed. The larvae are C–shaped, have a very firm wrinkled hairy body, a very small head and tiny legs; they move on their backs, which is a very quick way to identify them. Larvae overwinter wherever they have been feeding, that is in compost, manure, leafmould or rotting wood, and they pupate in June/July. Some adult beetles might emerge in the autumn, but the main emergence is in the spring when they mate. Following mating, the females lay their eggs in decaying organic matter, and then die. Larvae grow very fast, and before the end of autumn they would all have moulted twice. They have a two year life cycle. Rose chafers are found over southern and central Europe and the southern part of the UK where they seem to be sometimes very localized. They are a very beneficial saprophagous species (detritivore), their larvae are the insect equivalent of earth worms and help make very good compost where they are often found in great numbers. Colour The metallic green colouring of the beetle's surface is the reflection of mostly circularly polarised light, typically left circularly polarized light. When viewed through a right circular polariser, they appear to be colourless. Many species of scarab beetles (scarabaeidae) are known to emit typically left circularly polarised light (see Circular polarization in nature). outspread wings In popular culture In his book Synchronicity (1952), Swiss psychologist C. G. Jung tells this story, starring a Cetonia aurata, as an example of a synchronic event: A young woman I was treating had, at a critical moment, a dream in which she was given a golden scarab. While she was telling me this dream, I sat with my back to the closed window. Suddenly I heard a noise behind me, like a gentle tapping. I turned round and saw a flying insect knocking against the window-pane from the outside. I opened the window and caught the creature in the air as it flew in. It was the nearest analogy to a golden scarab one finds in our latitudes, a scarabaeid beetle, the common rose-chafer (Cetonia aurata), which contrary to its usual habits had evidently felt the urge to get into a dark room at this particular moment. I must admit that nothing like it ever happened to me before or since.